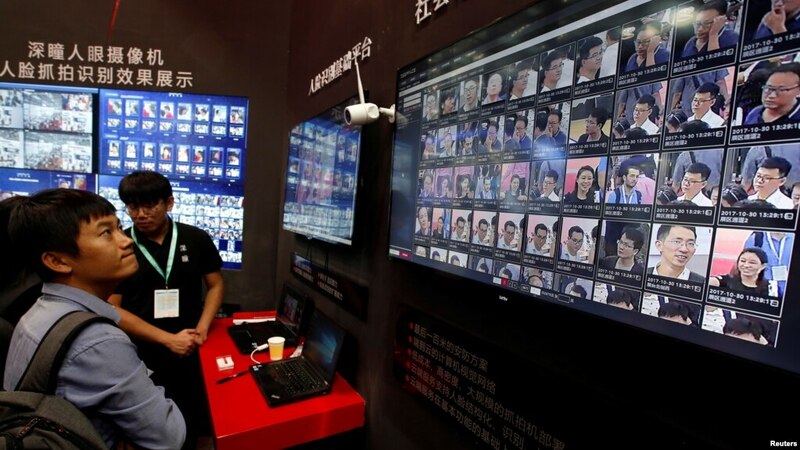 acial recognition technology is shown at DeepGlint booth during the China Public Security Expo in Shenzhen, China, Oct. 30, 2017. China is turning artificial intelligence, face scanning, and other Big Data systems into new tools domestically to enhance the communist party’s command and control systems. The party’s methods of surveillance and increasing use of technology present an interesting contrast with the ongoing scandal concerning the scraping and manipulation of Facebook data. In fact, analysts argue, the scandal and its after-effects will seriously impact China’s efforts to extend its surveillance systems to other countries. In China, facial recognition and artificial intelligence are being used to stop jaywalkers and to control the number of sheets of toilet paper a person can obtain when using public toilets. Authorities in the southern city of Shenzhen recently began using the combined technology of facial recognition, mobile networks, and social media apps to send offenders fines in real time. Visitors experience facial recognition technology at Face++ booth during the China Public Security Expo in Shenzhen, China, Oct. 30, 2017. And that is just a portion of the state’s growing tech-infused control. China’s capabilities also allow it to monitor business and political activities across numerous countries that are using Chinese technology platforms, including telecom equipment, payment systems, internet software and engineering standards. The number of countries and markets using Chinese technology platforms is growing by the day, analysts said. A man poses for photos in front of a computer showing Facebook ad preferences pages in San Francisco, March 26, 2018. Facebook is giving its privacy tools a makeover as it reels from criticisms over its data practices and faces tighter European regulations. The Facebook-Cambridge Analytica scandal involves the use of personal data collected from 87 million people for the purpose of political manipulation in the United States and other countries. Coming amid growing concerns about alleged Russian manipulation of U.S. elections and controversies surrounding the use of fake news, analysts say the scandal will result in massive regulatory changes in areas like privacy and monopoly of data by a few companies. And the backlash could be seen across several countries where Chinese companies have gained a foothold by building elaborate telecom and internet infrastructure. Alex Capri, a senior fellow at the department of analytics and operations of NUS Business School in Singapore, cited the case of Malaysia, where Chinese Internet giant Alibaba is closely integrated with a vast section of local business through its e-commerce platform. There are signs that Malaysia and other countries may do to China what Beijing has long done to foreign businesses, namely demand that servers used by foreign companies are physically located in their jurisdiction. Once implemented, Chinese social media and e-commerce platforms could lose much of the business edge they enjoy at present. Chinese companies have been keen to extend their reach to Europe with not just physical infrastructure construction but also data and telecom networks. They will now have to follow the European Union’s new General Data Protection Regulation (GDPR), which comes into effect May 25. The GDPR would be a challenge to Chinese companies accustomed to standards in which ordinary people enjoy few access rights. The new European law makes it compulsory for foreign companies doing business in the European Union to keep the data of EU residents secure and make it available to any such resident who demands it. “If an EU citizen, EU resident, asks Alibaba to provide this information with all the information that they have in their database, Alibaba has to abide. If they don’t, they will get into some discussion, or conversation or trouble with the EU authorities,” Kersi Porbunderwalla, secretary general of Copenhagen Compliance said. China is likely to remain immune to the wave of regulatory changes that are expected to sweep through the developed world following the Facebook scandal, Capri pointed out. “The Chinese model, which essentially says, ‘Look, the state has to have access to all of this data, the State has to mandate that you turn over this data that is requested, the State also needs to get the encryption keys to your programs,” he said. He said the Communist Party is unlikely to bring in major regulatory changes to protect privacy because that would mean cutting off data access for itself.